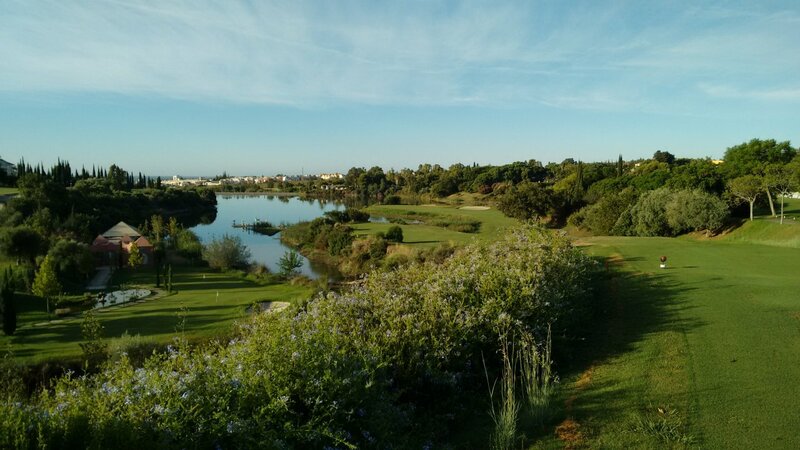 This course is part of Villa Padierna which has three golf courses - Alferini, Flamingos, Tramores. Tramores is a short course, so not reviewed further on this site. The villa itself (a 5-star hotel) is a large slightly faux Italianate design. Pleasant enough places to sit out and have a drink, modern design rather than old-style gracious. Beware parking here. The Villa has underground parking (dark and cramped but usable by day-tripper golfers). There is additional parking further past the Villa. Use it ! Careless parking on the road will get you ticketed fast. Allow time to walk between parking/clubhouse/start tee boxes. Next to the first tee for the Flamingos golf course is the clubhouse for the Flamingos golf club. This is run separately from the Villa Padierna hotel. The golf club is less expensive for food and drink, although service there is a bit lower quality. As a local golfer I always use the golf club facilities (as opposed to the hotel facilities) whenever I can. Flamingos is not a long course. There are 5 Par 3s, of which 3 are quite short (average only 135 meters). The first 9 holes have quite narrow and sloped fairways, and I think them more interesting than the 2nd 9 holes. The 10th (stroke index 1) is an odd hole where your best target off the tee is a small peninsula jutting into the lake. Then from there over water again to the green. Unusual, but not in my view a genuine signature hole. On holes 11 through 18 the fairways open out a lot and have little slope across them. Hole 13 goes up a hill then hole 14 comes back down. Ditto for holes 17 and 18. Apart from those holes, the course is not hilly at all. There are two genuine dog-legs, the rest of the holes are fairly straight. A nice variety of hole layouts. Fairway grass generally is OK, but not particularly high quality. There is some water (a deep canalised stream, one large natural lake, 2 small artificial lakes) in play on about 6 holes. There are an average number of bunkers, including a lot very close to or just in front of greens. These are bowl-shaped, have medium coarse sand, have no bunker lip worth mentioning and are not particularly deep. So easy to play out of, and in most cases even a flat club like a putter is a realistic option. The greens are nice: quite soft, large, a few tiered, mostly undulating but not severely so. About half the greens are elevated to a degree, but given their large size there is always a good chance you can land on some part of the green. Medium-fast with generally good-quality grass. No green surrounds to speak of – just 1 meter off greens they have mowed the fairway grass a bit shorter. I found Flamingos quite an easy course as a 15-handicap player. I was perhaps a bit cautious off the tee on the front 9, but the back 9 was definitely "go with the driver" territory. Given the course is quite short, a low-handicap golfer will not be struggling to reach any green in regulation here. And for all levels of golfer, the sheer size of the greens and their receptiveness means the course is very forgiving in having lots of green to land the ball on. Playing out of the green-side bunkers is also easy. In summary this is neither a parkland course, nor a hilly course, but half-way inbetween. It does take good advantage of its relatively inland location, without being a spectacular course. Basically the sister course Alferini is best for handicaps up to 15, whereas Flamingos is best for handicaps 15-25. Fair enough – Villa Padierna offers two quite different courses. On Flamingos the basic course layout is fine and offers enough diversity for the "average golfer". I do have a few niggles with this course though. The first is relatively minor. There are no hole maps on the course and the scorecard only has a very small printed course map. I also find the signage on this course bafflingly poor. The "Next Tee" type signs are never where you quite want them to be or point in unclear directions. I used reverse on my buggy an awful lot here. The second niggle I have is more serious and concerns the maintenance of the course. They are making an effort to fix marks (divots on tee boxes and fairways, pitch marks on greens) but the way they do it leaves a large number of sandy spots that just do not seem to heal properly. The purpose of putting down sand is to encourage the grass to grow back. It is not an objective in its own right. The grass grow-back just does not seem to happen. The entire course is riddled with little sandy spots – some new, some clearly much older. Maybe they need to do something different (mix seeds in with the sand, use finer sand, maybe throw in some fertiliser, water after repairs...). It is not up to me to guess - the guys doing the repairs need to figure it out. It is their responsibility to "stay ahead of the game" in the way they do repairs. Which brings me to the main point about Flamingos. It is definitely not cheap. If I am paying that sort of money, I absolutely expect a course in good condition (even though it does not affect my game a lot). So they need to sort out their maintenance regime. This is still a nice gentle course though – and I recommend it on that basis for the average golfer. But if Villa Padierna puts itself out as 5-star experience with prices to match, then I think both Alferini and Flamingos should be 5-star experiences in their own different way. Alferini is at that level. Flamingos is not. It is really more a 3-star golfing experience. So Flamingos as it stands now is not a course I will rush back to. 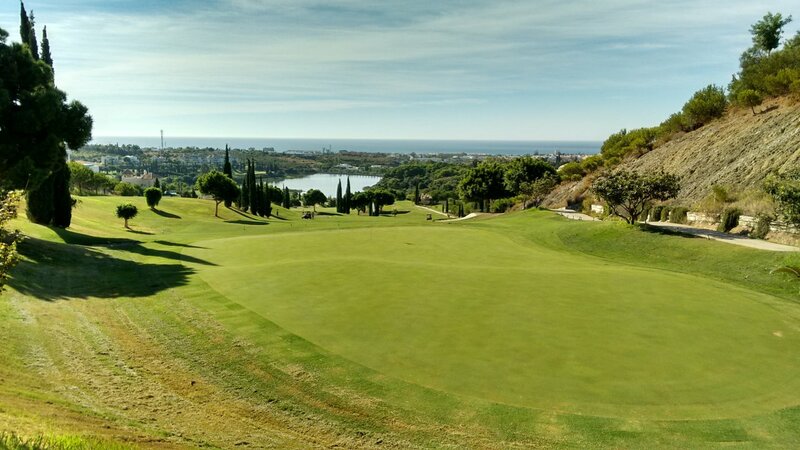 There are other courses on the Costa del Sol that for a bit less money offer a nicer day out for a mid-handicap player like me. Review last updated: August 2015. Number of times played: 2. Flamingos is represented by the brown dot. 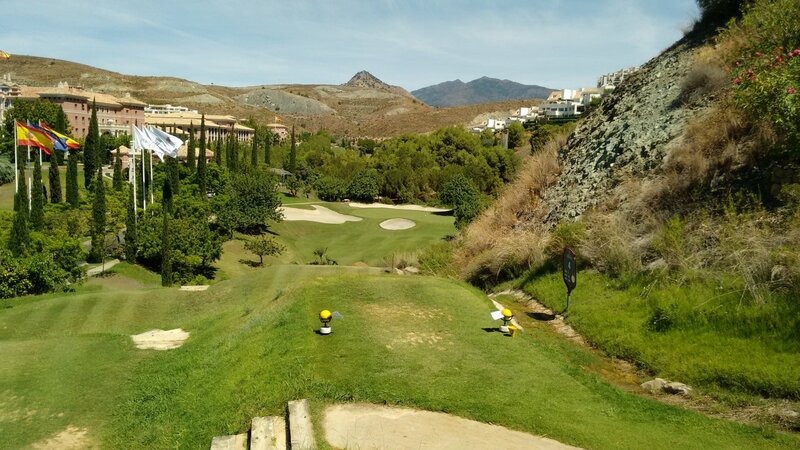 It shows the course is both shorter and easier than most courses on the Costa del Sol. An 18-handicap player can expect to play this course exactly on handicap 18. The other Villa Padierna course (Alferini) is represented by the yellow dot. It shows Alferini as significantly longer and more difficult than Flamingos.